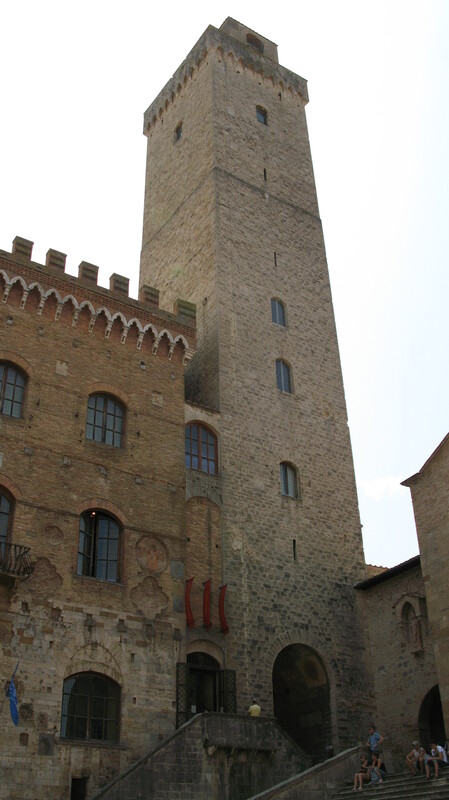 On a very hot day in July we left the air-conditioned comfort of our car and, along with several coach loads of tourists, struggled up a big hill to the town of San Gimignano perched on the top. The town is famous for its towers, of which there used to be many, but now only 14 of the original 76 remain. Built as symbols of their owner’s wealth, they were the 13th century’s equivalent of a man buying a faster sports car than his neighbour. But that was not why we were there. We were there to taste the wine. But only after a granita to cool us down. 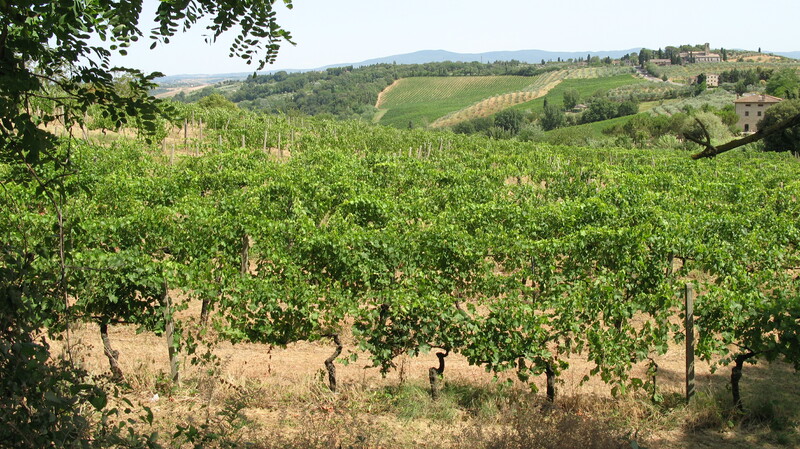 Vernaccia di San Gimignano growing in the fields below the town. The town is not very big but the fact that it appears in every guidebook about Tuscany means that there are lots of visitors, and unfortunately all the shops are geared towards filling their needs. Shop after shop was filled with tat, cheap wine and lots of things shaped like boars. There are a couple of welcoming specialist wine shops, air-conditioned, wooden cabinets and low lighting, but you really have to look to find them. In the end we settled for trying the wine alongside lunch at a small restaurant in one of the many tiny side streets. We tried a carafe of the house wine with our pasta dish and it was ok. The colour was deeper than expected, a yellowy green colour that reflected the light brick of the stunning skyline that towered above us. The aroma was very citrusy. It was in the mouth that this wine revealed itself as Italian as the acidity raced along the tongue catching at the back of the throat and causing a little cough. It didn’t really develop from there and became a little boring by the end of the carafe. One of the few remaining towers. San Gimignano wine does not have the best of reputations, with a few people wondering why it was promoted to DOCG in 1993; it was also the first wine ever to be awarded a DOC in 1966. All I can say is that it is perfect on a very hot Tuscan summer’s day when you need something refreshing and easy going to cool you down.